Are you tired of living a life that feels mediocre? Perhaps you see everybody and their mama, getting engaged, starting careers, having babies, and pretty much living it up and you want to know their secrets to happiness. Or maybe you want to be the shining example of what it means to live your best life. Get ready to have the ultimate go-to list that is packed with 30 different tips for living your best life! Success! Now check your email to grab your tips. 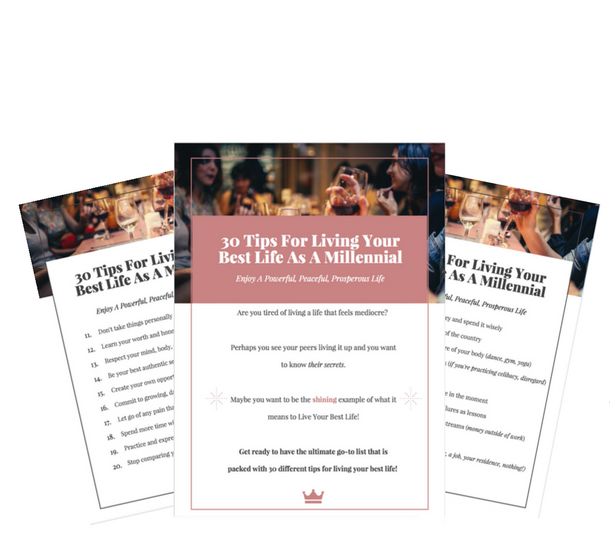 I created this FREE list that includes 30 Tips for Living Your Best Life As A Millennial so you can stop wishing for an amazing life and start actually living one.